There are a number of messages that are sent to visitors when it looks like there is a delay replying to their messages. You can adjust the content of these messages as needed. Out of office messages are sent at most once every 5 minutes. You can use text variables in these messages. When chat goes idle and assignee is offline - This is displayed if the chat has gone idle and the assigned user is now offline. When a new chat is ignored and there are no users online - This is displayed if a new chat has been ignored and there are no users online. When a new chat is ignored and there are users online - This is displayed if a new chat has been ignored and users are online. When a user sends a message to an assigned chat where the user is now offline - This is displayed if a user sends a new message to an assigned chat, but the assigned user is now offline. 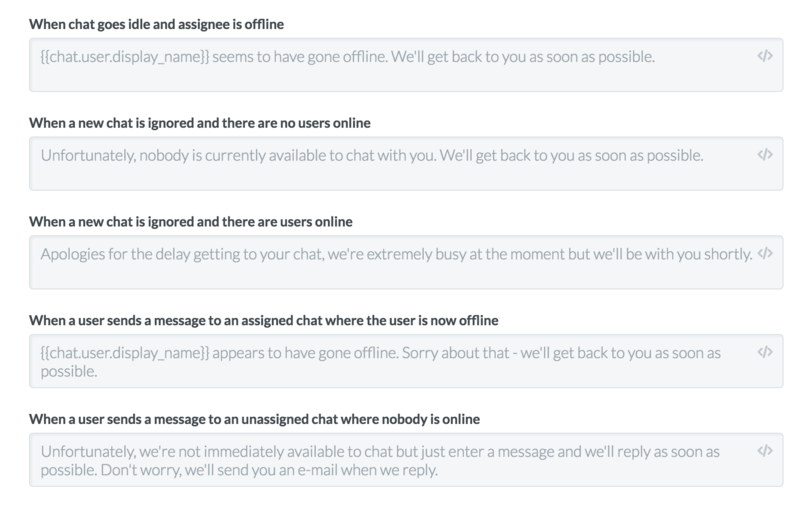 When a user sends a message to an unassigned chat where nobody is online - This is displayed if a user sends a new message to an unassigned chat, but nobody is online.